increasing parental awareness of the problem. Research also suggests that friendship acts as a buffer for bullying's harmful effects. Finally, teaching assertiveness, empathy, and emotion management to students promotes their social & emotional development. This campaign is designed to prepare facilitators for working with students, their parents, community organizations. 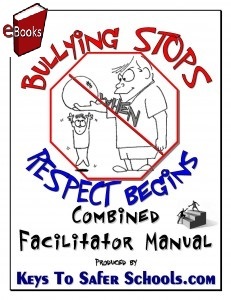 The name of this program describes it: Bullying Stops when Respect Begins. This is the theme of bullying & Cyber bullying prevention. Those who lack respect for themselves are more likely to be victims of bullying. Those who lack respect for others are more likely to be bullies. Those who lack respect for how technology can harm are more likely to become cyber bullies. Those who lack respect for their school are more likely to stand-by while others are being bullied. A school that lacks respect for the students or the education process is more likely to tolerate bullying. Therefore, respect is the basis for preventing bullying. The primary focus is on developing internal changes in attitudes that will cause long-term effects from within for the bully, the victim, the school/organization(staff & students) and the parents. This book provides information on how its program/curriculum can be embedded. That is, the ideas presented here are not intended to be offered in a class then only discussed when that class is in session. Rather, the concepts are intended to be integral parts of every area of the school/organizations experience. Regardless of the class, playground or extra-curricular activity, respect should be taught, expected, reinforced and praised. There should be special times set aside for working through exercises in the provided workbook and once each week students should meet in groups to allow them to look back over the week and admit failures, tell of successes and praise others for acts of respect. As each student goes in turn he or she will describe what was learned about respect this week, what was done to earn the respect of others, and what was done to return (or show) respect for others. These groups should be small enough that everyone has opportunity to interact. The teacher facilitator must keep the comments moving and on target. What does the Curriculum provide? Levels of Severity in bullying - know when and how fast to act.